Dinner and a show? How about dinner and LIVE music? Blackbeard's features the best in local talent, performing from a vast repertoire including country, classics, blues, '60s oldies and even occasional kids' tunes when prompted. Most of our musicians also share some of their original compositions. Don't be shy about challenging our musicians and asking them to play your favorite tunes. Sometimes, they may be challenging YOU, our customer, to name a songwriter or composition, usually offering a free dessert to the winner. Both Blackbeard's locations feature live music nightly (except Sundays at Blackbeard's Too). Follow us on our Blackbeard's on the Beach and Blackbeard's Too Facebook pages for artists' schedules. 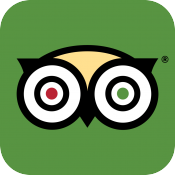 For more information, call Blackbeard's on the Beach: 361-884-1030; Blackbeard's Too: 361-776-0393. Adrian Taylor, a Corpus Christi native singer, songwriter, musician, biethnic Eclectic Redneck, raised on grits and tortillas, aka One Man Band presents CowJazz; A culmination of country, rock and roll, big band, crooners, Tejano, blues, and classical influences. He is an entertainer who is appreciated by audiences of all ages. Adrian learns songs that suit his style, and makes every song his own. He loves lyrical stories, and amusing lyrics and sometimes he makes them up! He has an unbelievably vast repertoire, spanning six decades of well known music, as well as a number of original tunes. He can play for at least four hours without repeating a song, unless requested. Even more amazing is that he does all of this from memory! Contact Adrian for booking information at altaylor16@gmail.com or (361) 425-4967 or for upcoming venues. 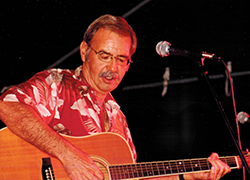 Bobby's name is synonymous with acoustic guitar in the Coastal Bend area (and beyond). 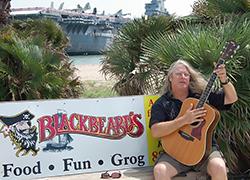 He has been playing acoustic baby boomer music for Blackbeard's since 1991 – that's 18 years, over 4500 gigs, entertaining half a million people! He knows the score when it comes to playing with an array of talented musicians, having played with musicians from Austin to Alaska. At times, his talented friends will drop in for a few songs or even a gig. He has combined his love of both music and live stage performance to create a concert atmosphere that swings from relaxed to highly charged. His acoustic finger-style music is both familiar and yet unique, as he brings his stylish interpretations to your favorite tunes. Bobby's music is a crowd pleaser for all age groups – and he knows how to put on a show! From "Itsy Bitsy Spider" to '60s favorites, he always finds something to suit the crowd and the mood. Bobby is the music coordinator for both Blackbeard's restaurants and can often be overheard quoting his favorite mantra: "The music will continue until morale improves!" When you go, be sure to ask him about his CDs. He'll be happy to share! Watch Bobby's cover of "Norwegian Wood." Watch Bobby perform "The Itsy Bitsy Spider." 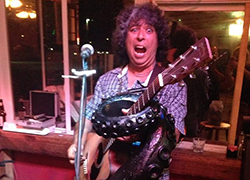 Ruben E. Limas has been a professional musician for over 25 years, beginning in the Rio Grande Valley as part of several semi-successful rock bands such as Safety in Numbers and Culture Shock. Ruben became a solo musician shortly before relocating to Corpus Christi in 1997. He has enjoyed entertaining at the many fine establishments in the area, and is fond of the camaraderie amongst his fellow musicians. 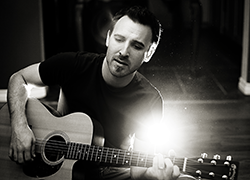 Ruben has a repertoire of over 350 cover songs and has released four CDs of original material. Over the past few years, Ruben has been busy as a music and art teacher, involved in the local community theater (Harbor Playhouse), and fronting his blues-based power trio Ruben and the Rolling J's. Steven Hansen is an independent singer/songwriter from Corpus Christi, TX. In 2007 He released his first studio album, "The Wounded Dog's Choir." Steven is the Director of Music at City Church in Corpus Christi and a Professor of Audio Engineering at Del Mar College. He is the Owner and Senior Engineer of Soundguys Pro Audio and the founder and manager of a local Corpus Christi music venue called "The Churchyard." Watch Steve Hansen's music video "Breathe Easy"
Learn more about Steve Hansen at www.ReverbNation.com.